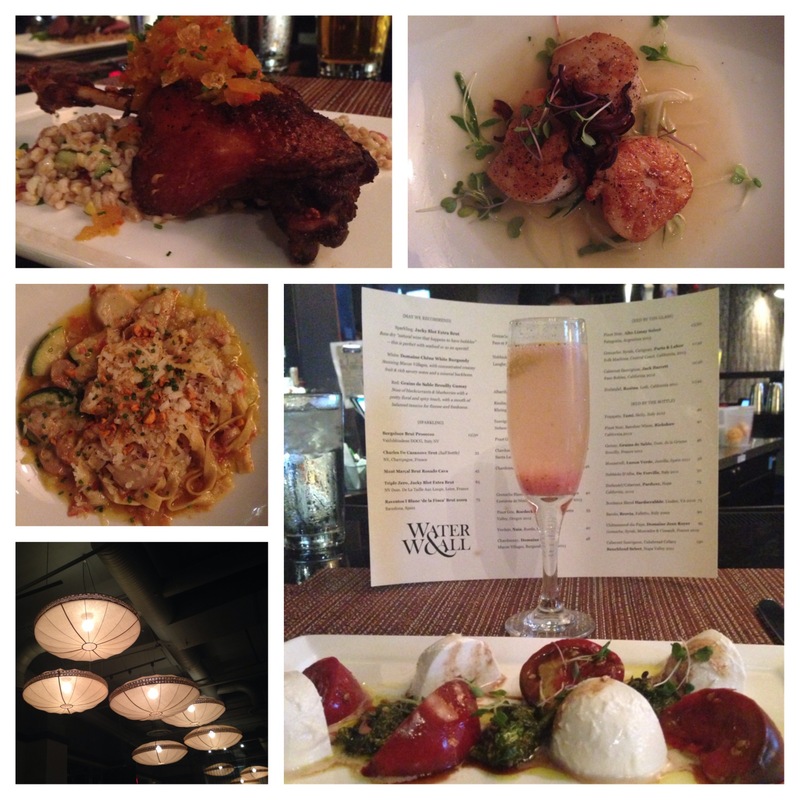 Chef Tim Ma, the culinary genius behind Maple Ave Restaurant in Vienna, VA opened Water & Wall in Arlington, VA last year and has received much-deserved praise. 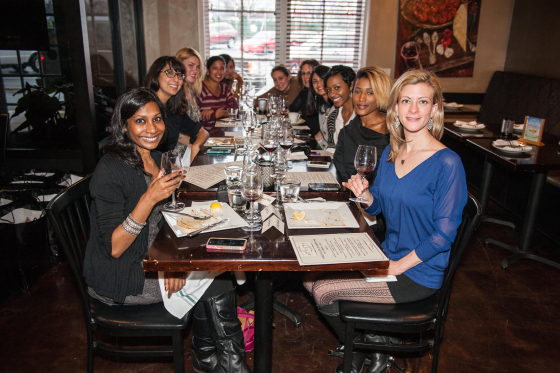 A hardware engineer-turned-Chef who went to the French Culinary Institute to pursue a burgeoning passion for the culinary arts has helped make the Arlington area more of a foodie destination. 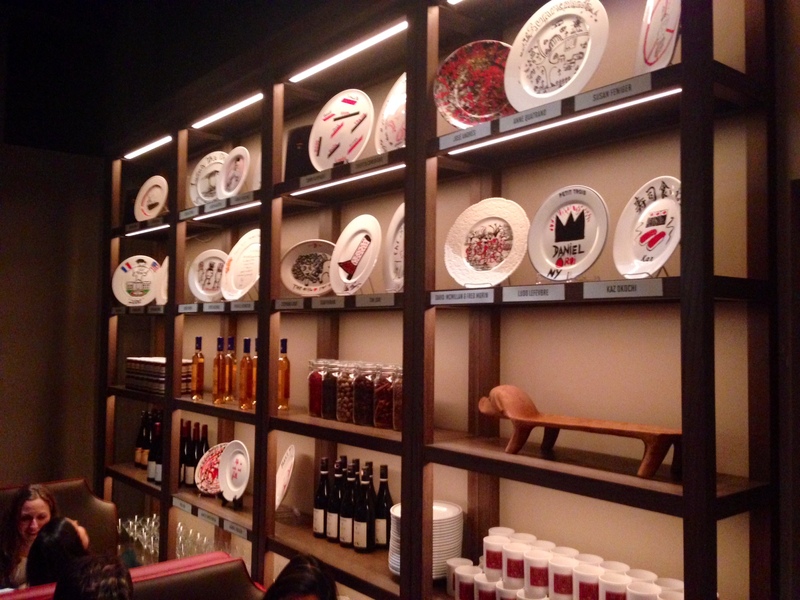 Water & Wall’s General Manager (and Chef Ma’s wife), Joey Hernandez is Chef Ma’s inspiration and rightfully so. 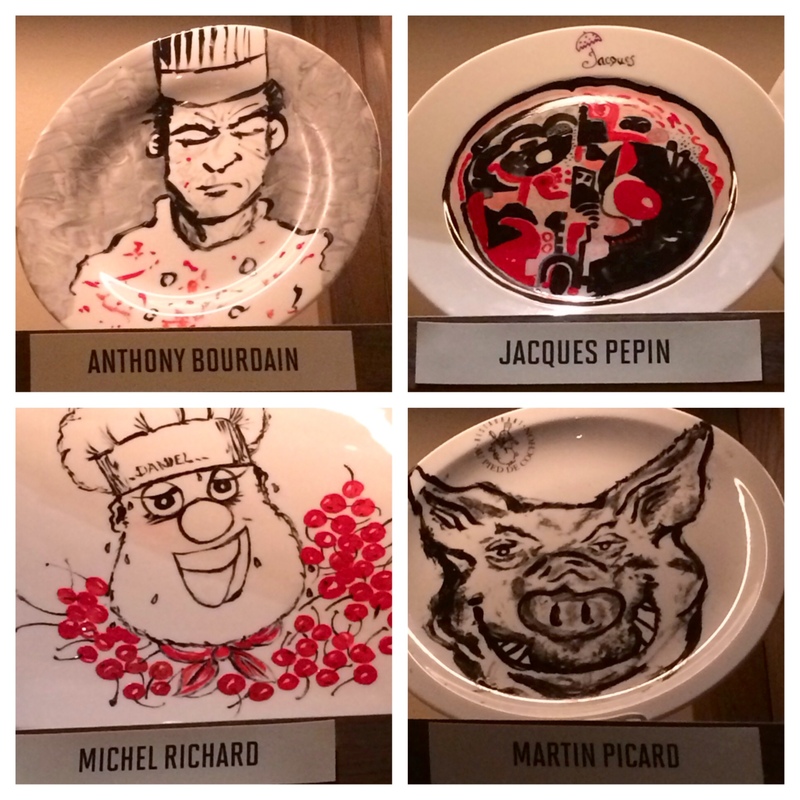 Joey was the one who helped Chef Ma take the leap in becoming a culinary artist. 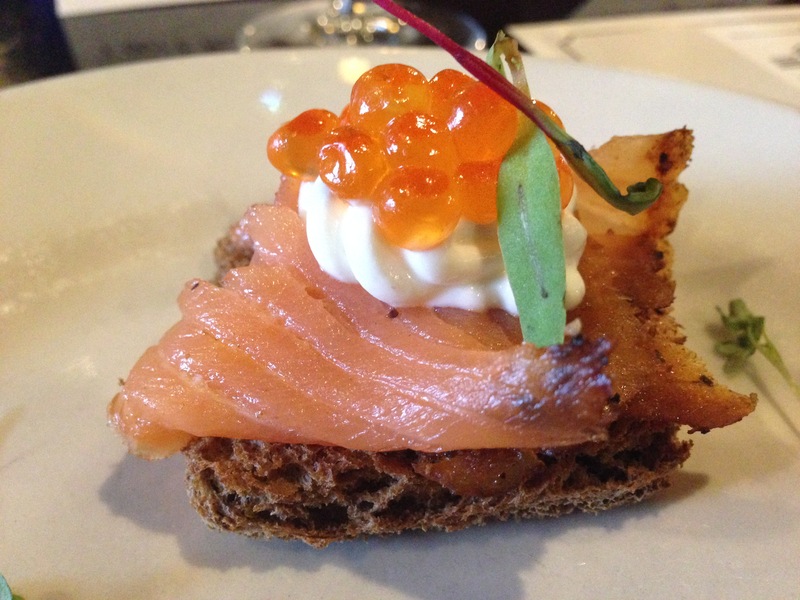 The restaurant is beautifully decorated, incredibly well-managed and such a pleasure to dine at. The two together make a powerful duo and are probably the nicest, funniest and most humble couple I’ve met in the restaurant industry. I first discovered Water & Wall last year. A good friend treated me to a dinner that will forever stay with me. 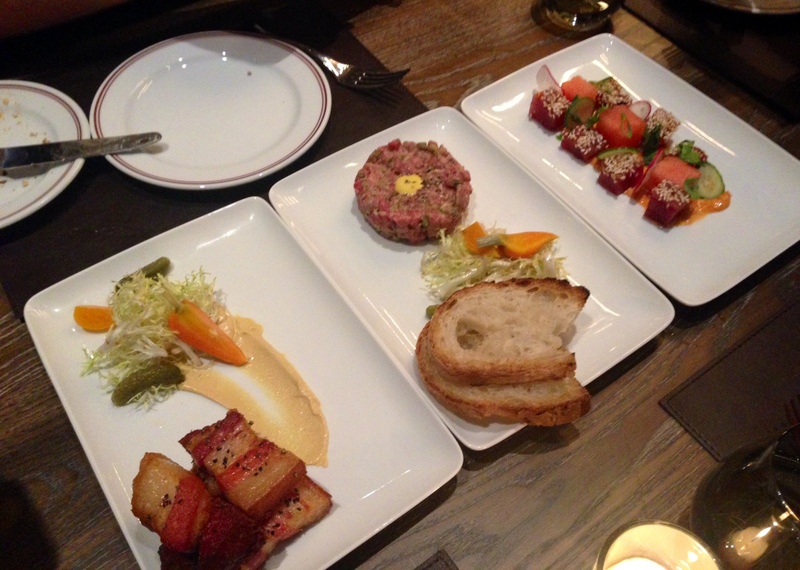 So much so, that I recently returned and once again, had an amazing time and extremely memorable meal. 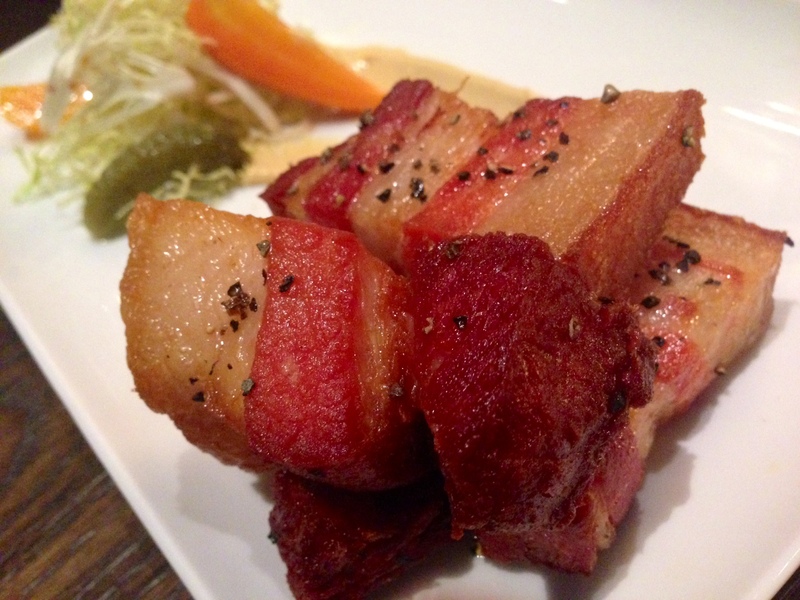 Here’s a little teaser snapshot of my recent drool-worthy culinary journey … You’ll want to continue reading to learn more about each dish. 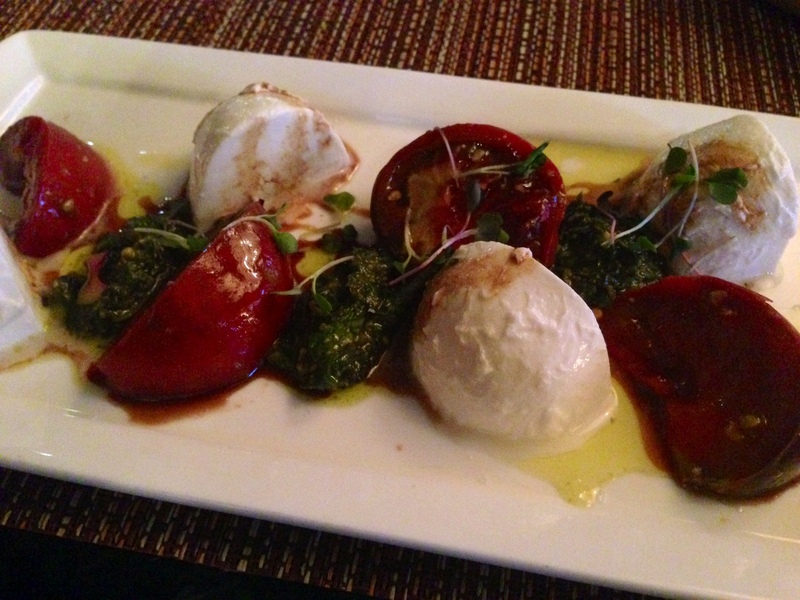 I’ll start off with the two appetizers: Heirloom Tomatoes with Fresh Mozzarella and Seared Diver Scallops. I’ve always been a fan of the combination of tomatoes and mozzarella since I was a little girl, but these plump tomatoes, with a beautiful deep red color, tasted like they were infused with sunshine. The fresh mozzarella was firm and possessed great flavor. What brought the two together was the basil pistou, saba and olive oil; and these three simple ingredients made every bite more scrumptious than the last. 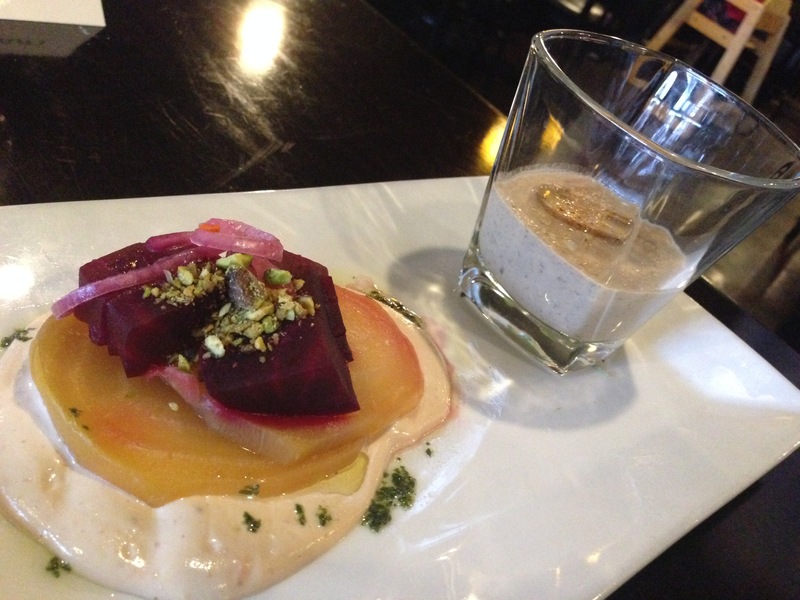 Vegetarians will delight themselves with this dish. 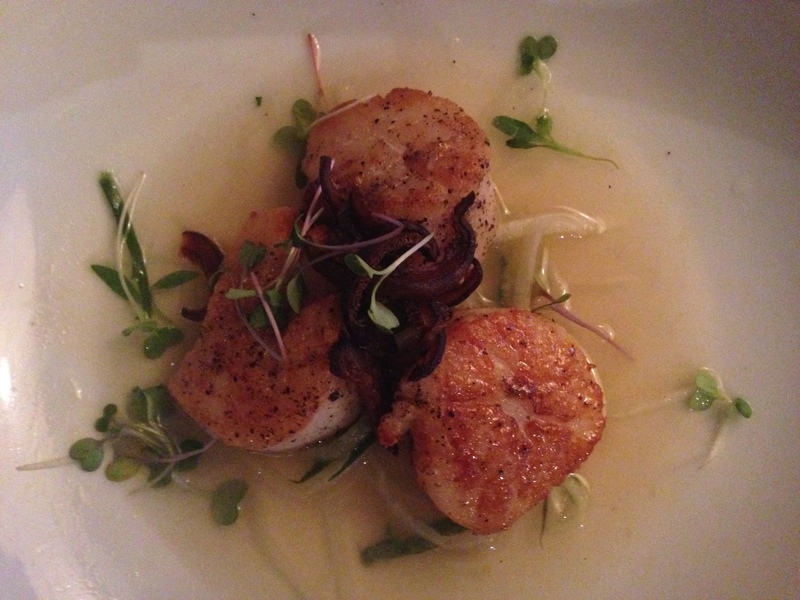 As soon as I saw scallops on the menu, a huge smile came across my face. 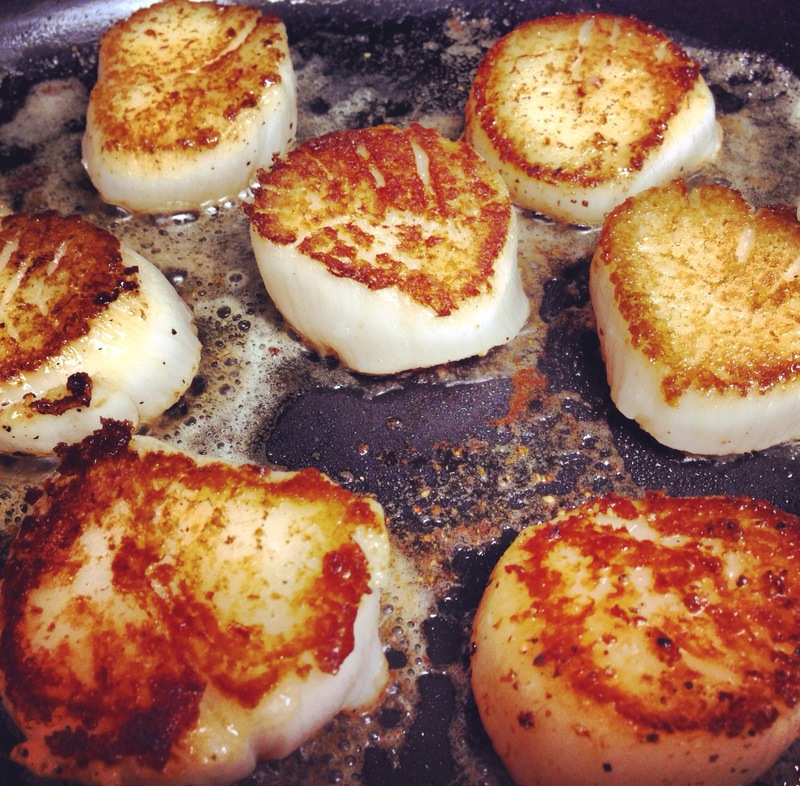 I absolutely adore scallops and these were incredible. Seared to perfection and buttery in taste, these scallops were perfectly soaked in a melange of yuzu and dashi over cucumber-daikon noodles topped with crispy shiitake. Seafood lovers, make sure to get this! You won’t regret it. 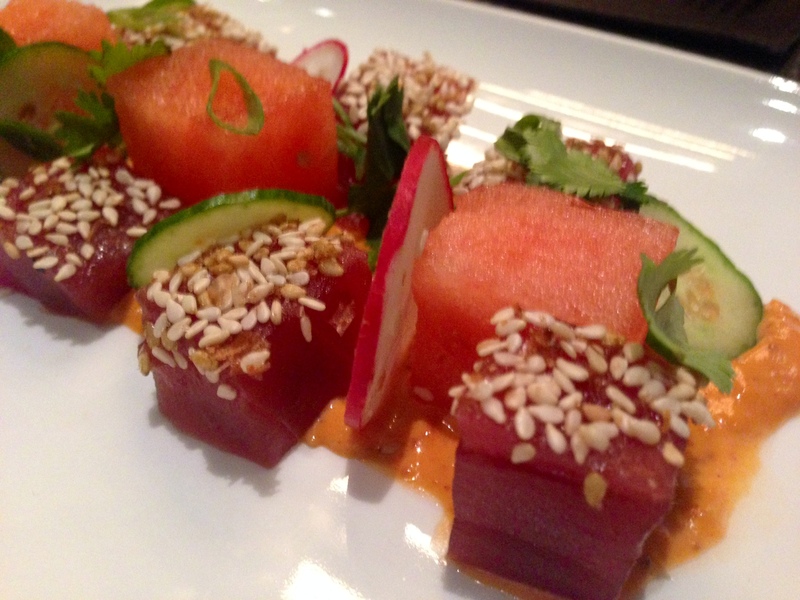 It’s a dish that radiates summer. 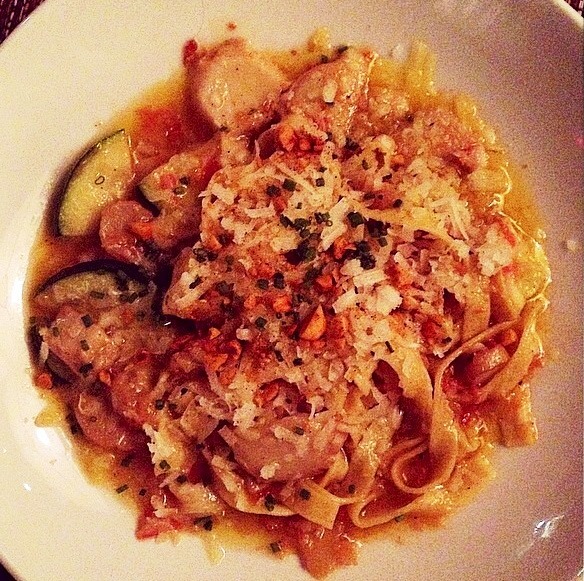 Next up two entrées that take it to the next level: Saffron & White Wine Fettuccine and Duck Confit. I always love to see how restaurants’ dress up pastas, and this combination immediately peaked my interest. 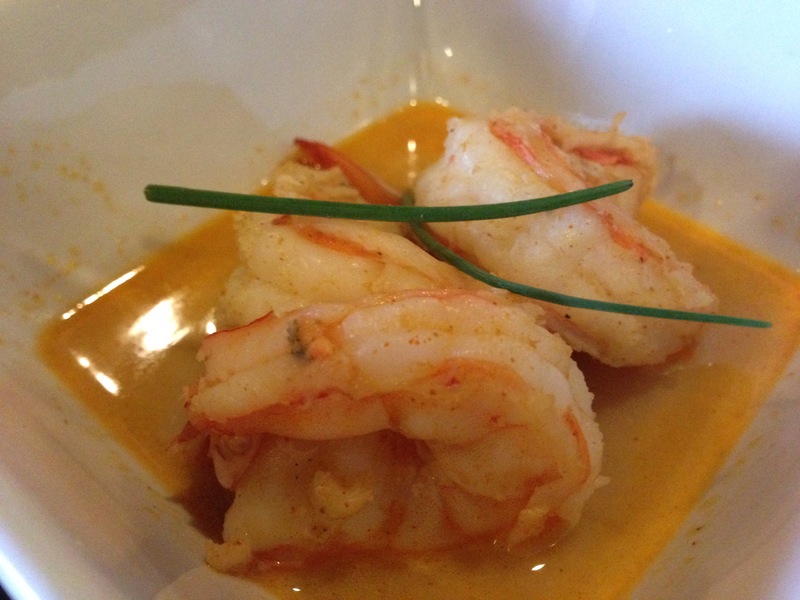 I will be up front and let you know that this dish is a tantalizing treat guaranteed to make any foodie drool. The saffron, white wine and sofrito run and swirl together amplifying each other’s flavor; and mixed in with a perfect balance of summer squash, mushrooms, paprika almonds and manchego, this dish becomes a pièce de résistance. One of my favorite main courses! 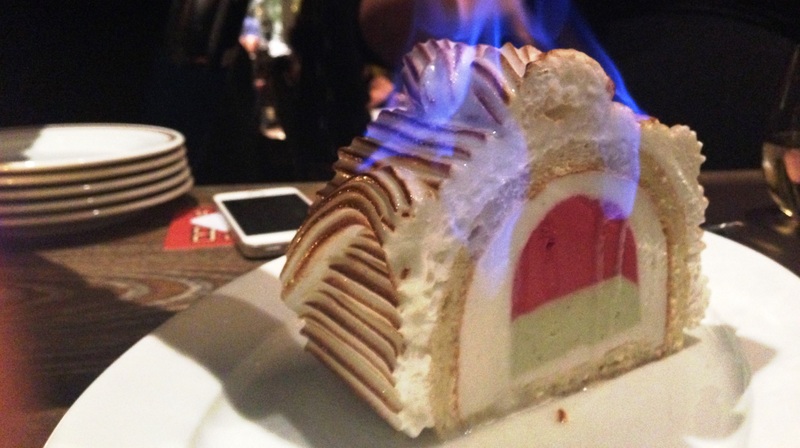 I had this the last time I came here and with such fond and savory memories, I had to get it again. Let’s just say my memory did not fail me 😉 The golden duck breast is crispy on the outside and tender and flavorful on the inside. On a bed of green tomato chow chow and summer vegetable farrow salad, this fusion makes for a signature dish that will excite even the most discerning palate. If you’ve been before, I don’t need to convince you to go back ;-). 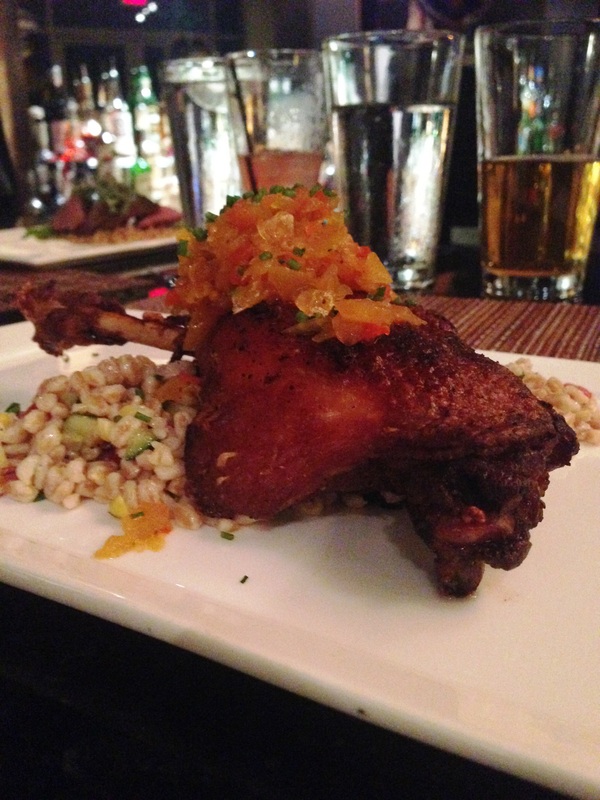 If you haven’t been yet, I hope this post has given you the impetus to go out and try it for yourself. I can promise you that you won’t be disappointed. 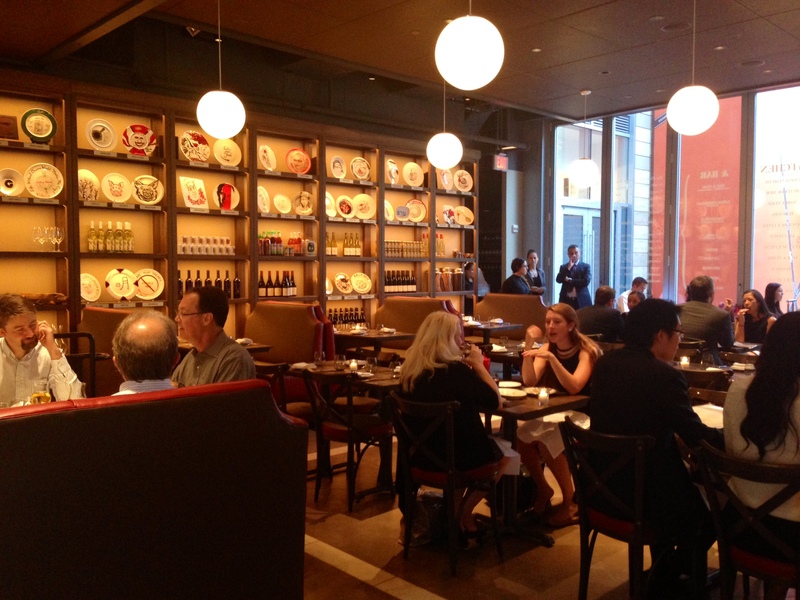 In case you need another good reason to visit, head to Water & Wall for lunch Monday–Friday between 11am and 2pm and enjoy their new lunch pop-up concept called Uncle Paul Ma’s Kitchen Lunch Pop-Up (in honor of Chef’s Uncle Paul who originally inspired him to follow his passion in pursuing a career in the culinary arts). This unique and delectable Chinese-inspired menu will be available until August 29th. Active on social media? So is Water & Wall. Make sure to follow them on Twitter and Facebook. You are at someone’s house, enjoying local food from the host’s country among people you have never met before and are having the time of your life. 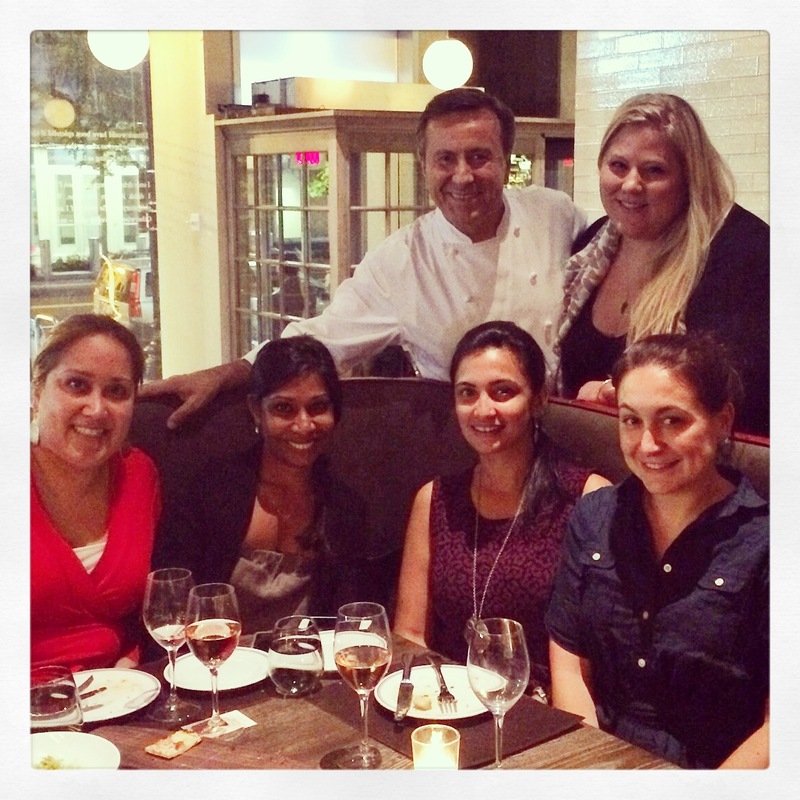 Well, this culinary adventure – Bookalokal – has arrived to the Nation’s Capital and I am overjoyed. 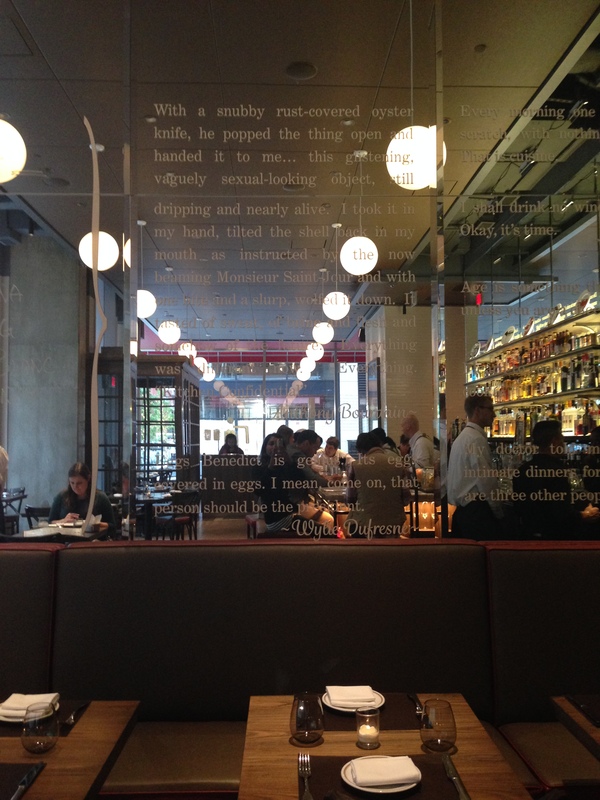 I first read about a similar dining concept in the New York Times but the featured city was Paris, France. Literally, the next day at a food blogger happy hour, I met Jackie Woodbury who had just been hired by Bookalokal for the Washington D.C. area. 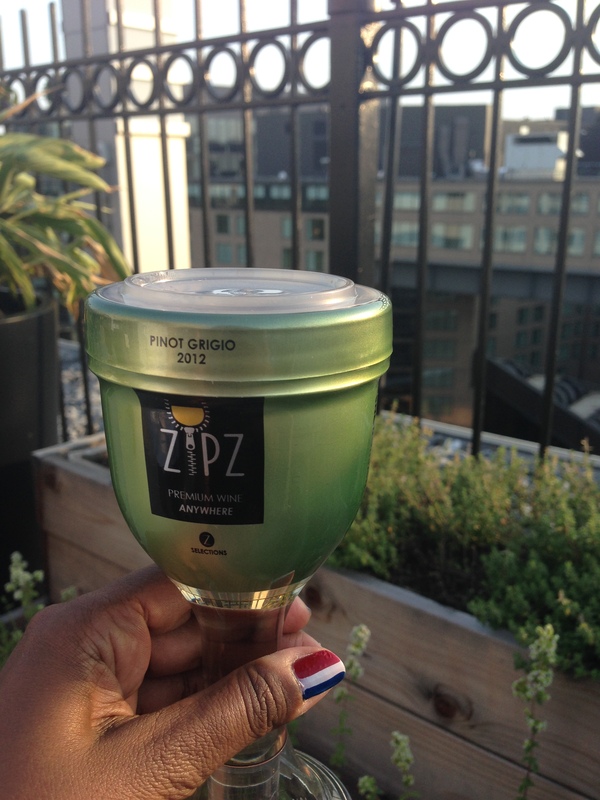 I couldn’t believe I had just read about this fun idea centered around food and travel and now it was becoming a reality. 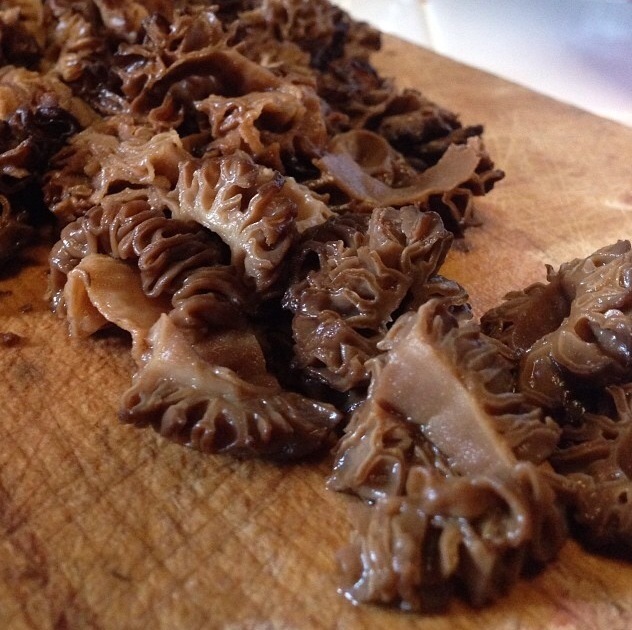 This online marketplace for local food experiences runs the gamut from themed dinners to cocktail classes to champagne and chocolate tastings. Seriously, can life get any better? 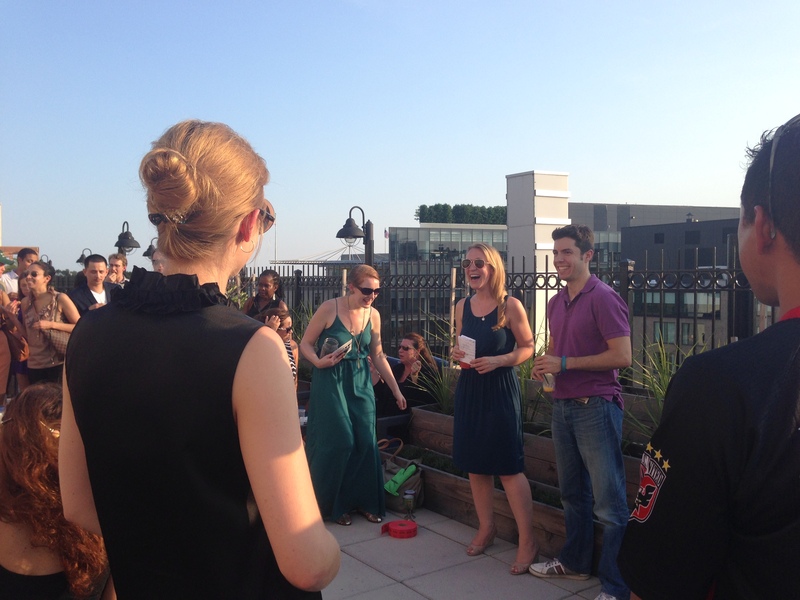 You can choose to be involved in either two ways – as a guest and indulge or as a host where you can demonstrate your skill set. 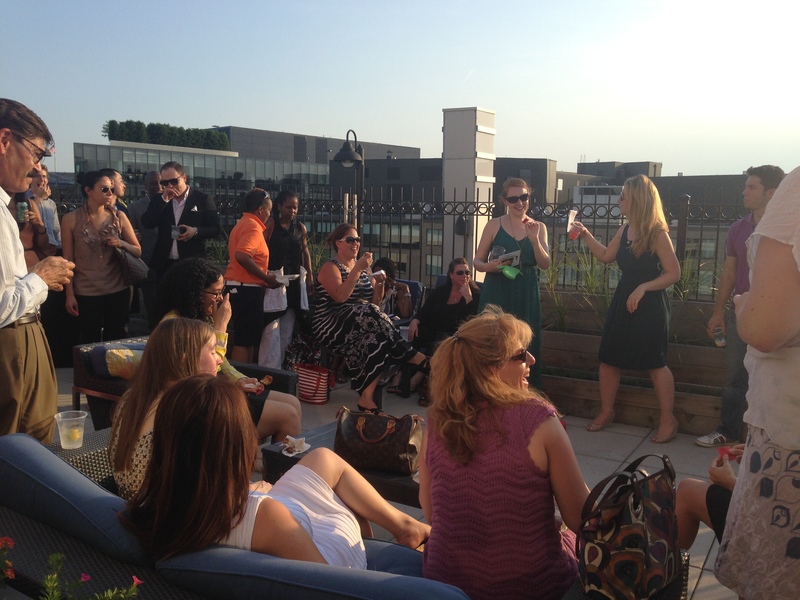 A few weeks ago, Bookalokal held a happy hour at the Liaison Hotel, on its picturesque rooftop, to officially introduce Jackie, as Bookalokal’s DC City Launcher. Guests enjoyed tasty bites from the hotel’s signature restaurant, Art & Soul, which included Chef Art Smith‘s famous chicken wings and a special Bookalokal cocktail that was incredibly refreshing. Evelyne and Frank spoke about Bookalokal and Jackie about her excitement on connecting the D.C. community with this new gastronomic concept. A little bit about the newest team member. Jackie, a passionate foodie, has lived in the nation’s capital for 7 years and is incredibly familiar with the D.C. food scene. 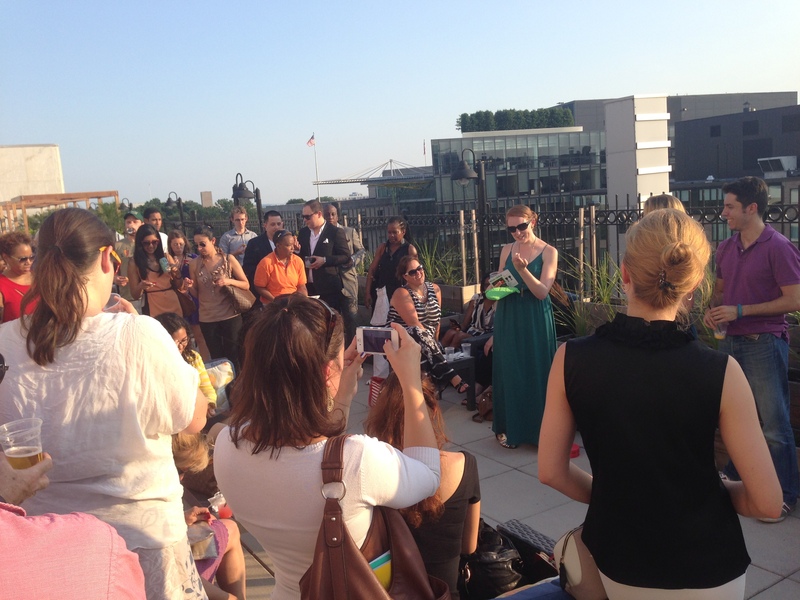 Not only has she already co-hosted a Bookalokal event, but she has also attended a few. This not only shows her commitment but also her enthusiasm for Bookalokal. I truly believe that she is the right individual to launch this program here in D.C. and quite honestly, she is the nicest person ever. I am sure she will be very successful in this venture. The merriment continued. The invitees were then quizzed on unique Bookalokal facts; and the right answers resulted in additional raffle tickets for great prizes such as complimentary Bookalokal dinners/events and a box full of Zipz Wine, premium wine-to-go. My advice is to go out and discover Bookalokal yourself. Already from word of mouth, I know that you won’t be disappointed and that you will enjoy some unforgettable bon appétit moments. Mustard. Moutarde. Mostarda. No matter how you say it, it is one of my absolute favorite condiments. 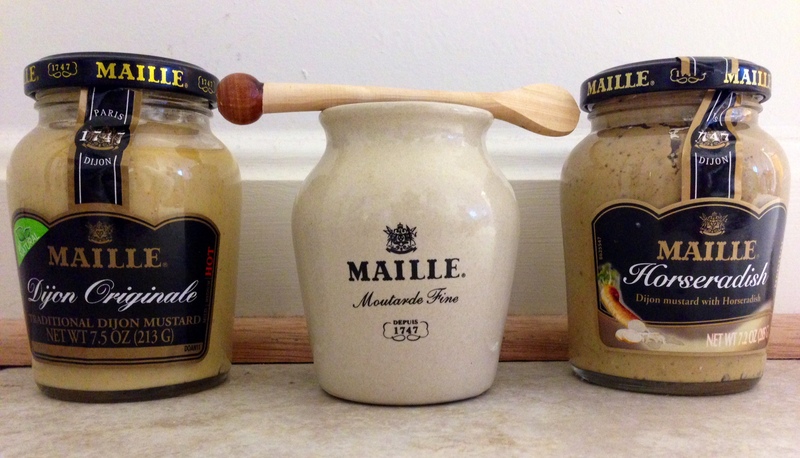 I have to admit though, I am quite loyal when it comes to brands and my preferred choice, not only for its taste but also its mustard flavors, is Maille. To me, it’s a little culinary gem. 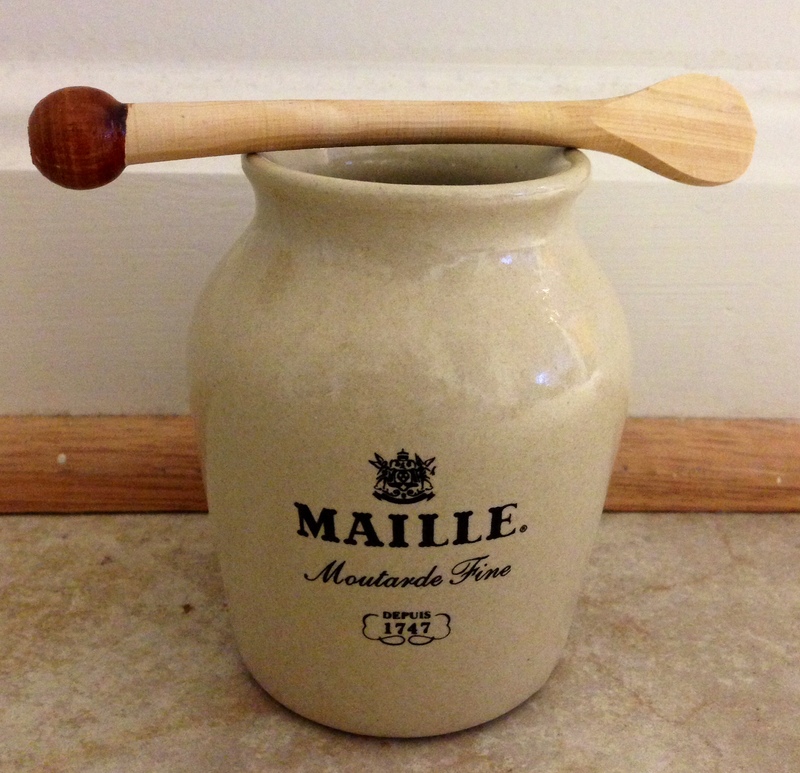 I always use Maille mustard for my homemade vinaigrettes and when I consume brats and boudin blanc sausages. Not familiar with Maille. Don’t worry. Here’s a little background history on this more than 265 year-old iconic brand. 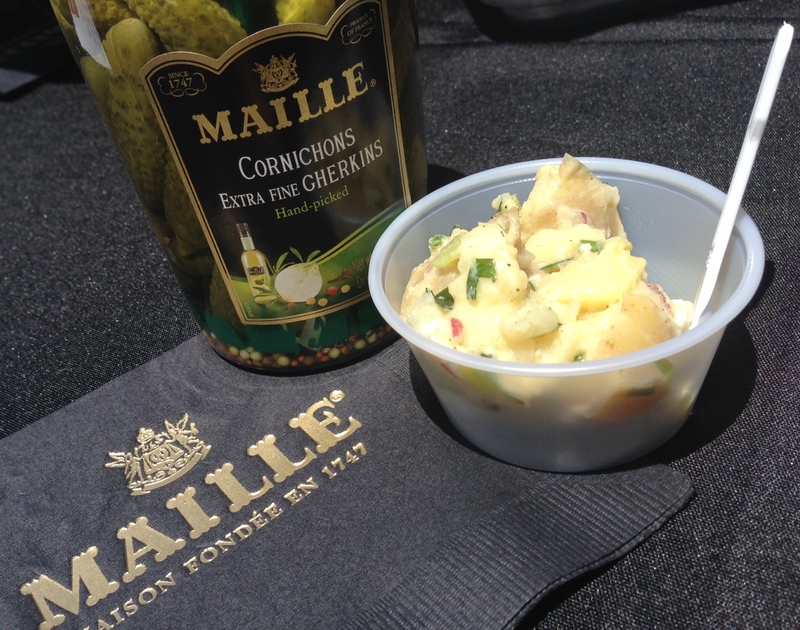 In 1747, Antoine Maille created La Maison Maille, which included products such as mustard, vinegar, and caught the attention of none other than King Louis XV of France. From that point on, La Maison Maille became the official supplier to Kings of France and many European Royal Courts. Today, it is the number one brand of imported mustard in the U.S. and the leading producer of mustard, vinegar and cornichons (small pickled gherkins with an extra tart bite) in France. 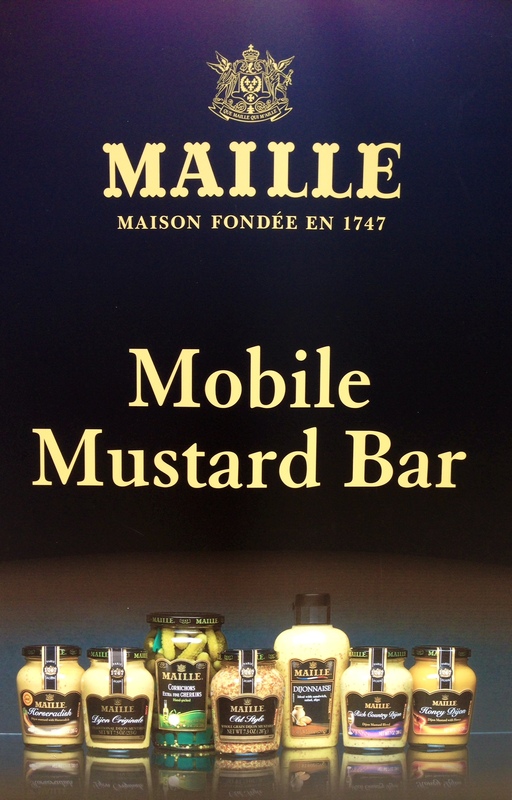 In an effort to conquer American palates, Maille decided to launch a national tour with its chic Maille Mustard Mobile. 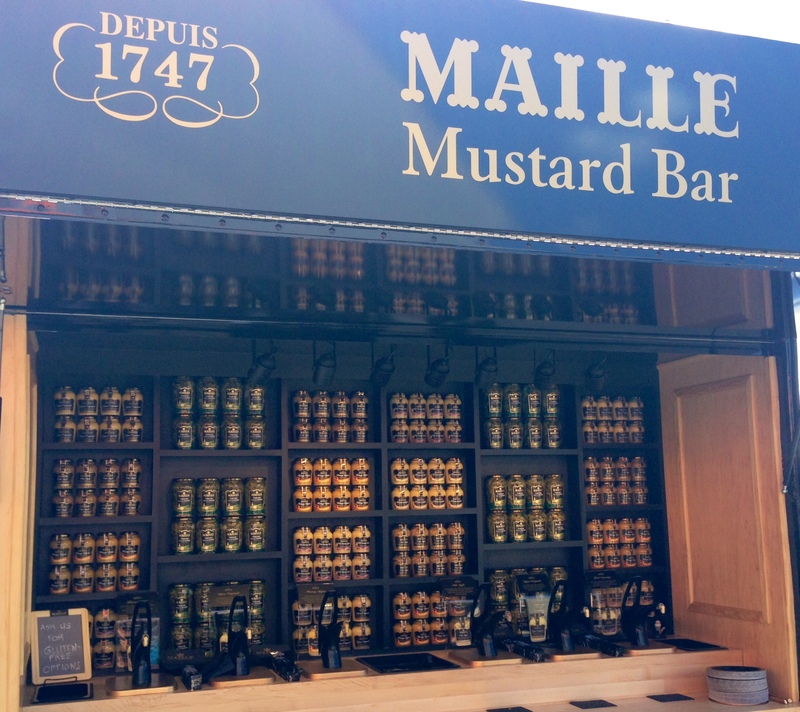 So, when I received an invite from Fraiche PR and Communications to the kick-off preview event of the Maille Mustard Mobile at Union Market in Washington D.C., I was elated. As I walked around the mustard mobile, I met up with fellow foodie bloggers and that’s where our culinary tasting experience began. 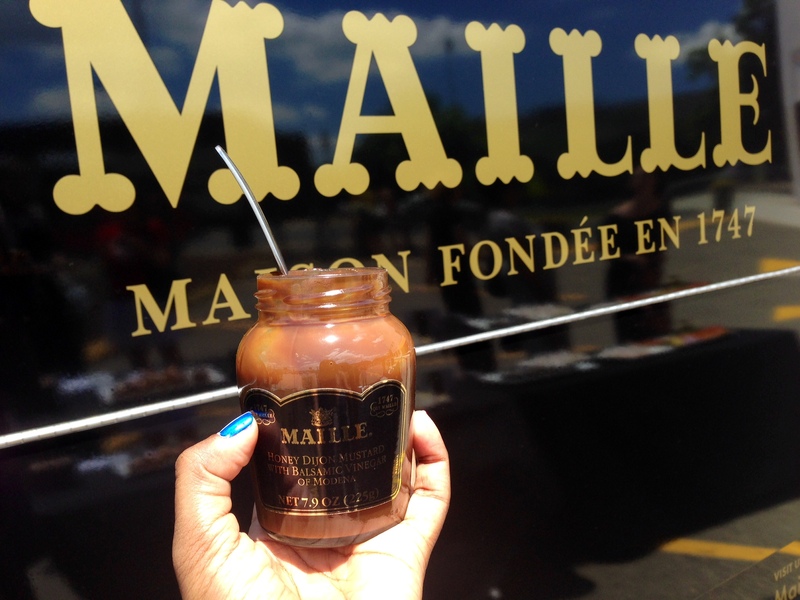 First, we had the chance to taste Maille’s newest mustard Honey Dijon with Balsamic Vinegar of Modena. I am not a huge fan of balsamic vinegar, because to me it is too sweet, but this one was delicious. 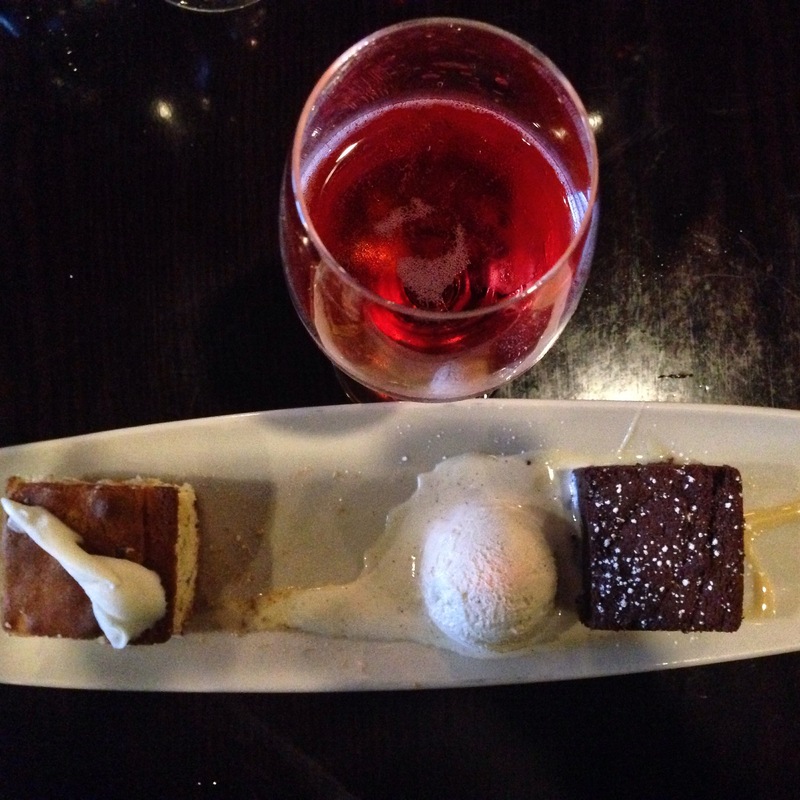 It was a perfect combination of sweet and savory. It was finger-licking good. Literally. 😉 We tried this mustard with pretzel sticks, which was yummy, but it would also be very good in sauces or salad dressings. 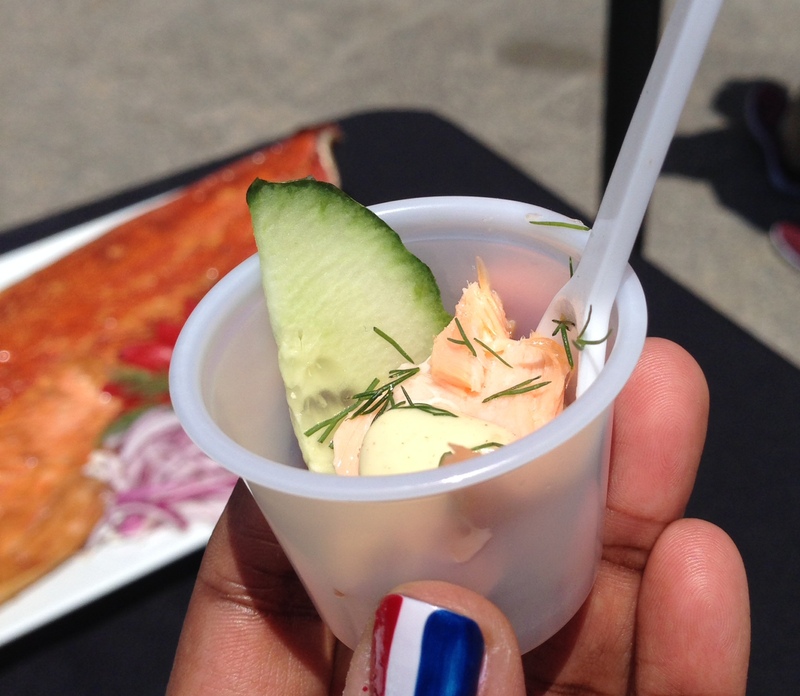 Second, we were treated to an array of gourmet bites that were made with different Maille mustards from Union Market Artisans. 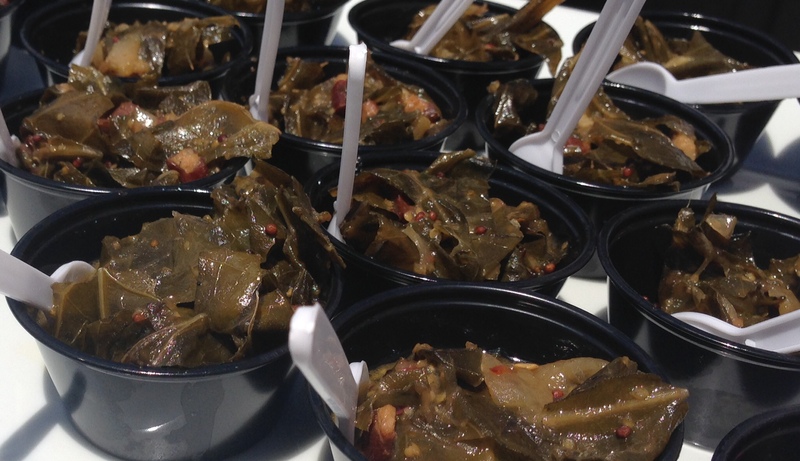 Braised collard greens with Benton’s bacon and Maille Old Style mustard by Rappahannock Oyster Co.
Lastly, we had the opportunity to compose our own mustard palette directly from the Maille Mustard Mobile. There were five mustards on tap that you could choose from – Dijon Originale, Old Style, Honey Dijon, Horseradish and Rich Country – I decided to try all of them, because pourquoi pas ;-). 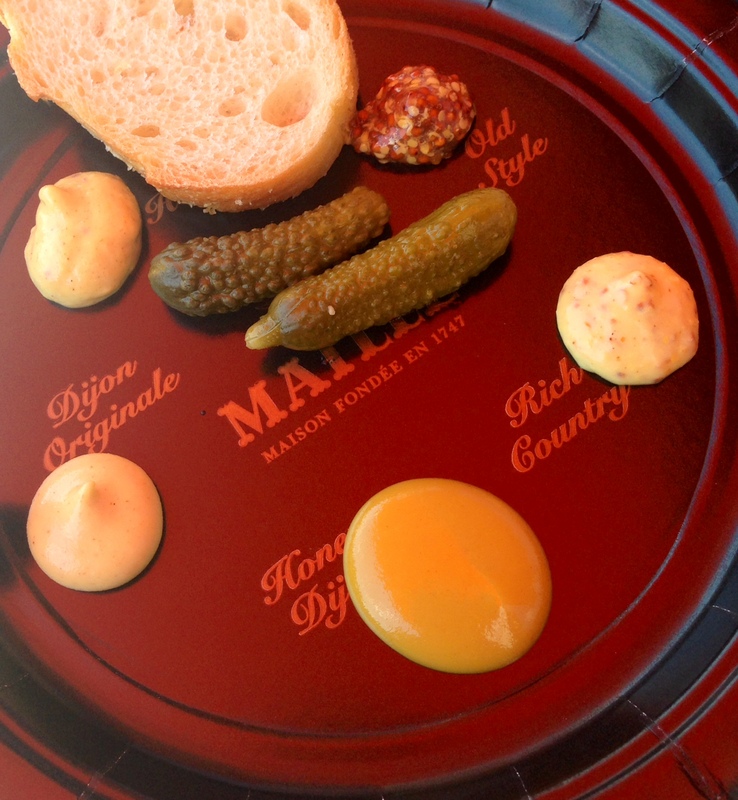 I loved that each plate was adorned with a few of Maille’s cornichons. 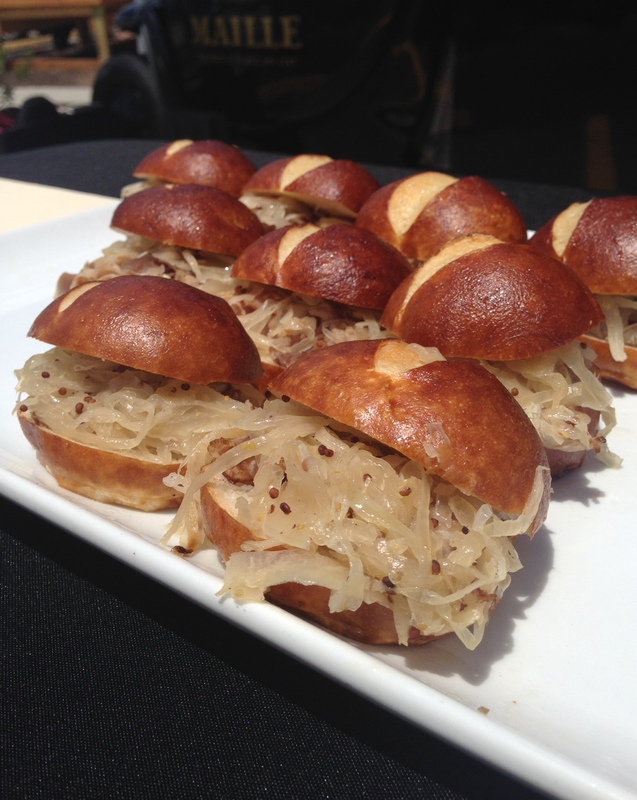 The winners for me were the Rich Country (an original variation on the classic Dijon mustard that includes white wine, cinnamon and ginger) and Old Style (characterized by the presence of crunchy mustard grains and robust medium-spicy flavor). Below are the scheduled stops for the Maille Mustard Mobile. If you happen to live in or be in one of those cities during those dates, I highly recommend that you go and check it out. You won’t be disappointed. Promise. Big thanks to Diane and Elsa at Fraiche PR and Communications and Maille pour une experience inoubliable et délicieuse! Mustard Lovers, you can find Maille on the below social media channels. 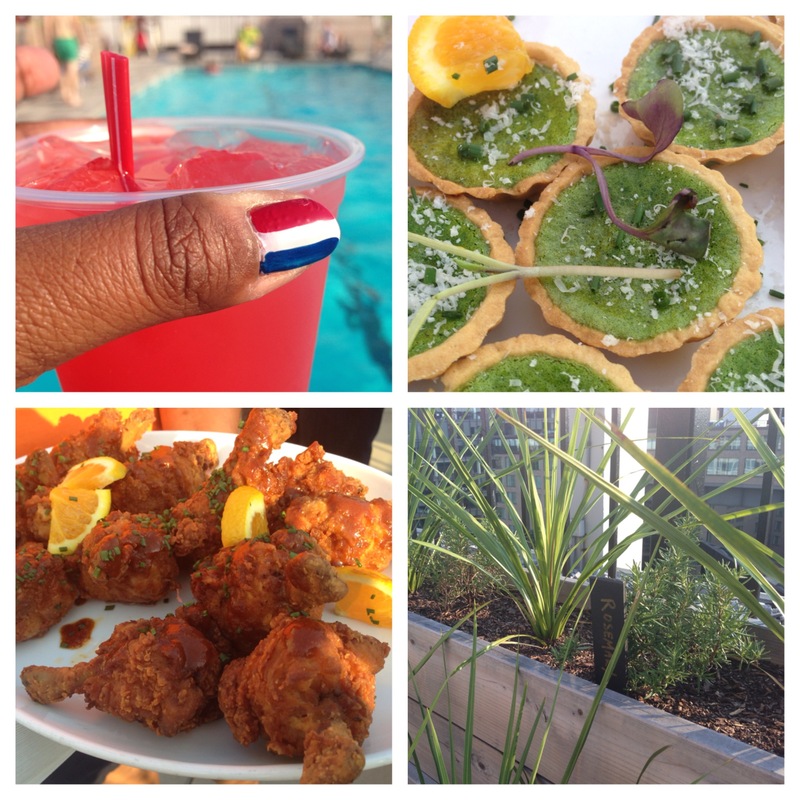 I encourage you to follow them for a true foodie experience! 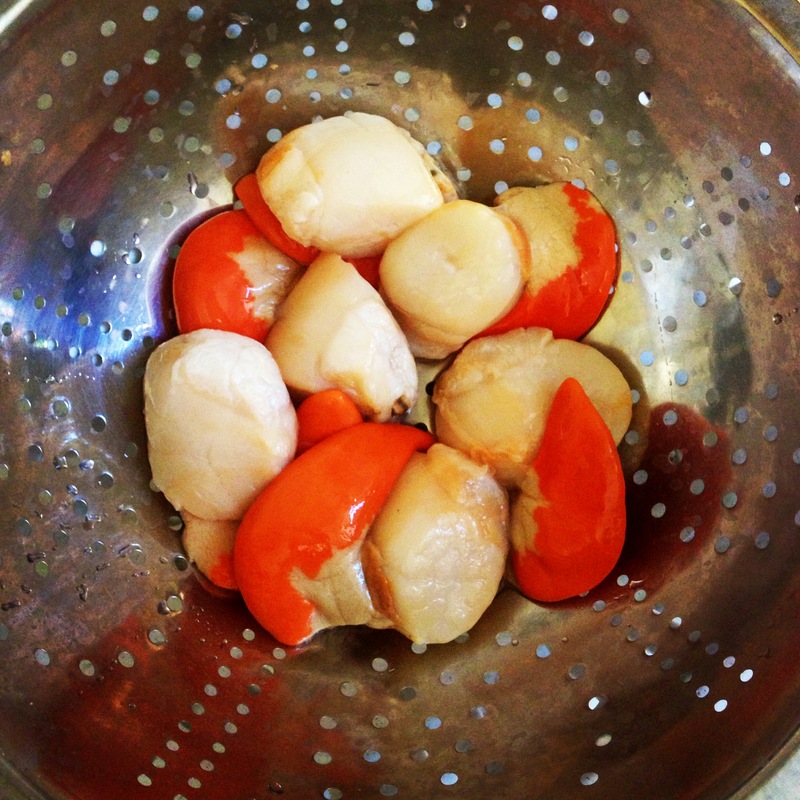 Last summer in the South of France, I tried sea scallops in their purest form with the corail attached (coral or roe) which happens to be the most tender part of the sea scallop and is considered a delicacy. In the U.S. the corail is taken off for a few reasons such as high mercury content and for preservation purposes, but I have to be honest, it was oh-so-delicious. 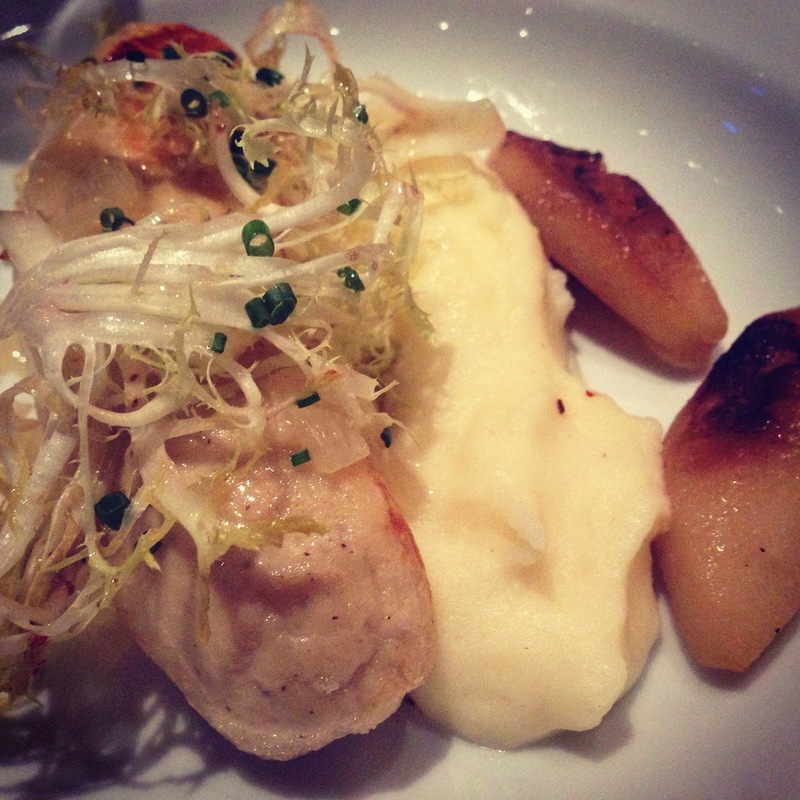 That said, scallops are no stranger to my palate. 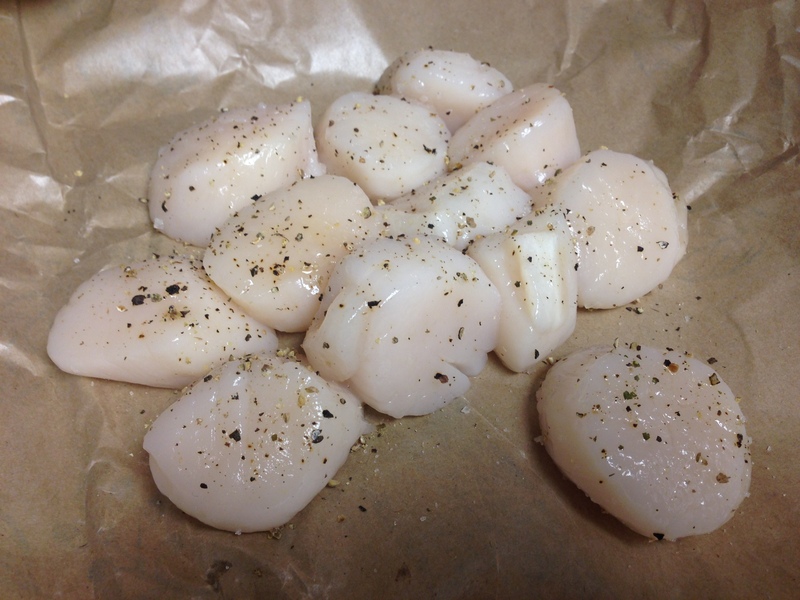 When I was younger my parents, who are excellent cooks, would make Coquilles St. Jacques (Gratineed Scallops – amazing) for special occasions but last summer’s reintroduction of scallops into my life made me want to experiment with different flavors. 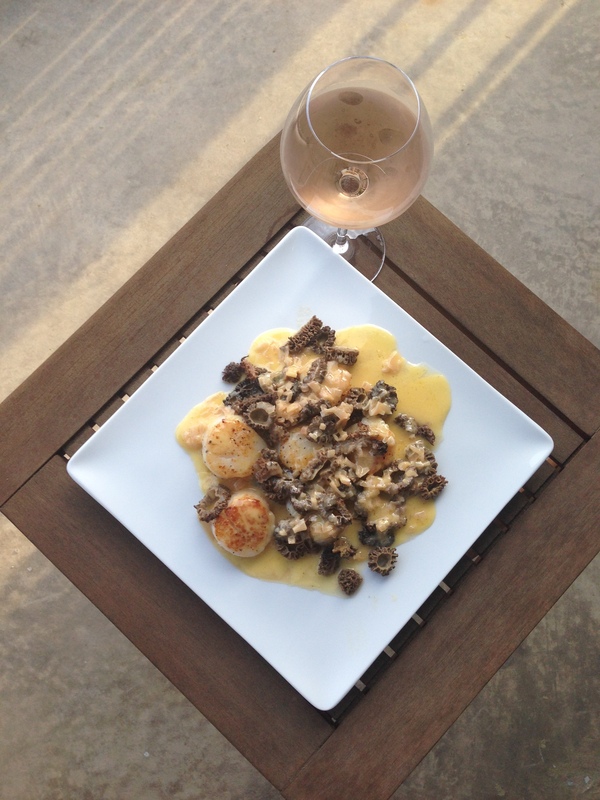 Of the scallop dishes I’ve made (Seared Scallops with a Herb-Butter Sauce and Scallops Provençal), this most recent dish with Morels in Beurre Blanc left me wanting more. Why this combination? 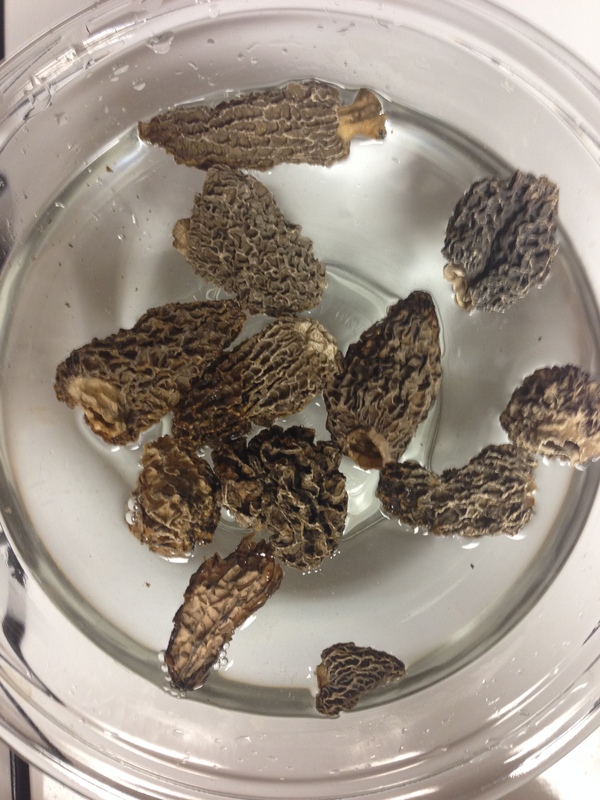 Well, I had been thinking for a while about how to combine my absolute favorite mushroom, morel, with scallops and with a little research and inspiration, I came up with this dish. 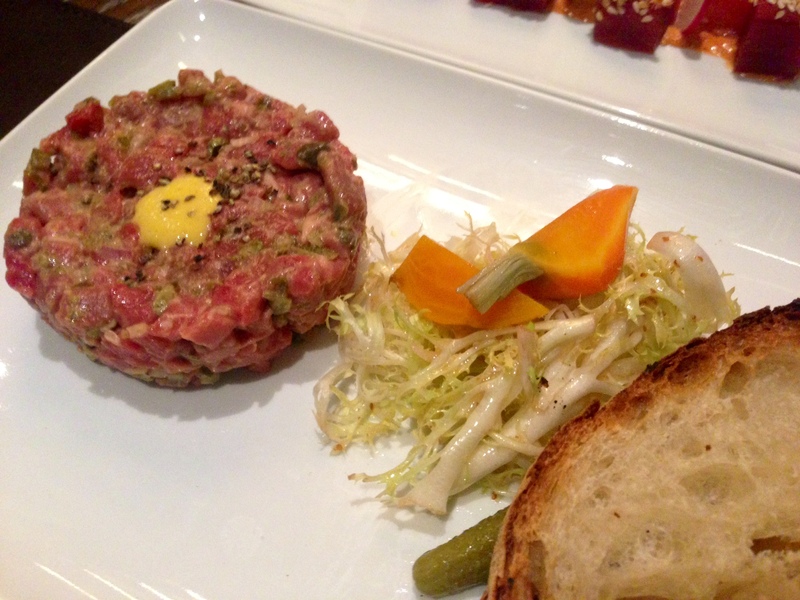 Warning, if you are not a fan of butter, you will want to pass, but if you are, let me introduce you to a meal that is perfect for a hot summer night with a glass of rosé … bien sur. 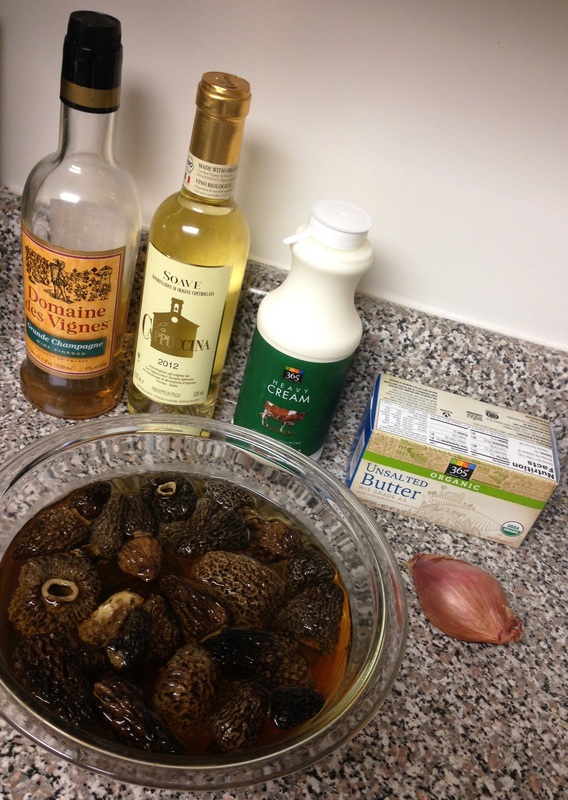 (L to R): Champagne vinegar, Soave Dry White Wine, Heavy Cream, Unsalted Butter, Morels (in hot water) and Shallot. Soak in hot water for around 30 minutes, so they become soggy. Then cut all into small horizontal pieces. 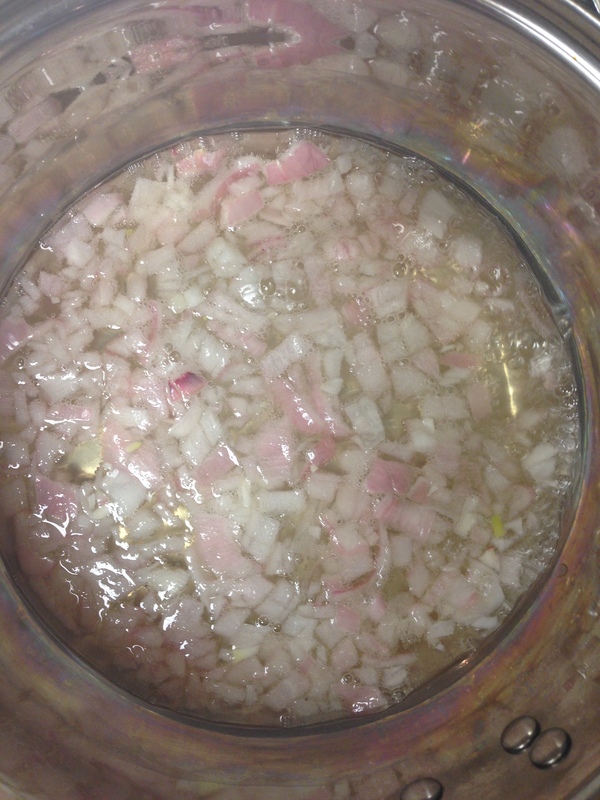 In a saucepan, combine the vinegar, minced shallots and 1/4 cup of the wine and bring to a boil. Once boiling, reduce the heat to low. Add the heavy cream and start whisking slowly. Then add in the cold butter by tablespoon square pieces and keep whisking. Once all of the butter has been used, add in the remaining 1/4 cup of white wine. Beurre Blanc in the making. 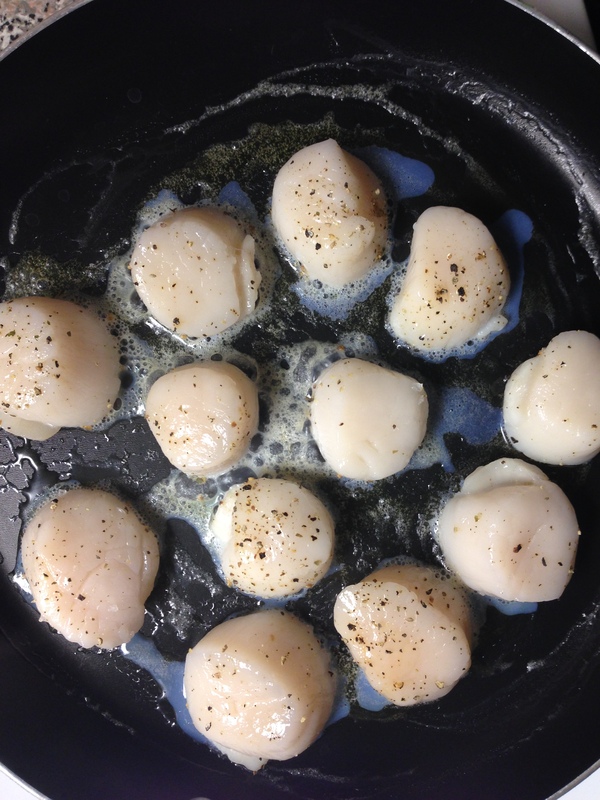 Place in the pan with a little butter and cook them for 3 minutes on each side (until they are golden brown). 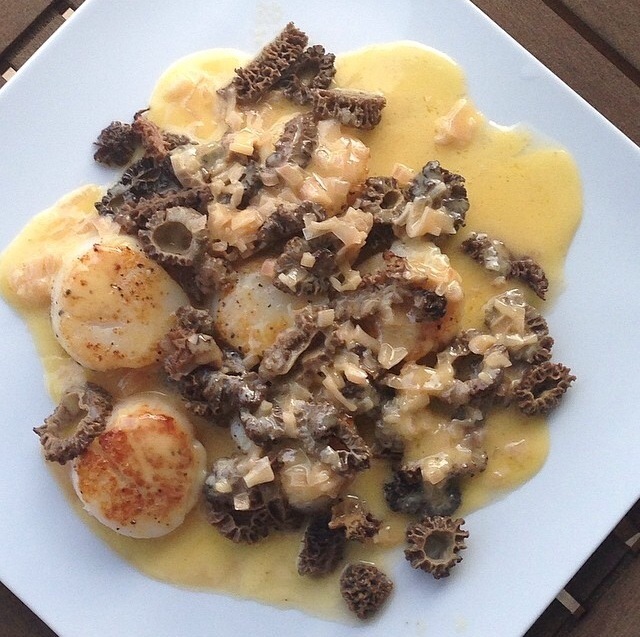 Once the scallops are done, place on the plate and top with morels and the beurre blanc et voila! 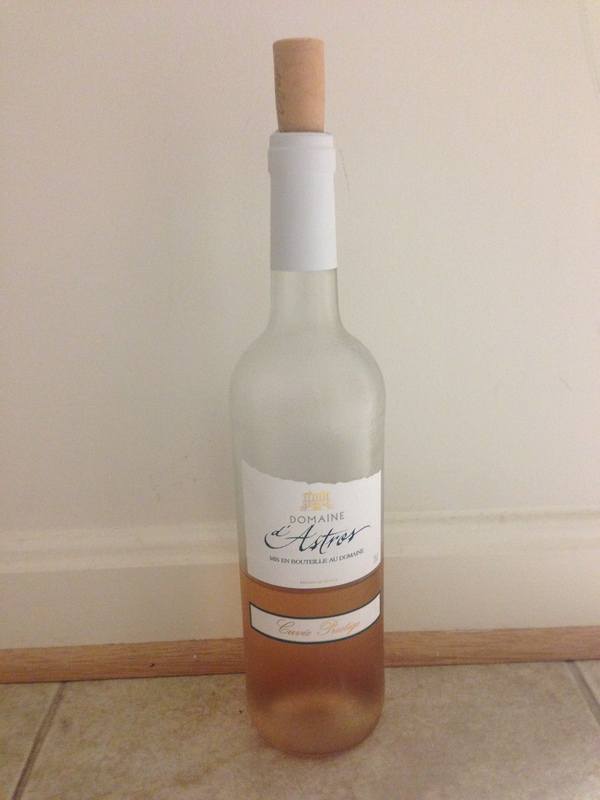 Since morel mushrooms and sea scallops are both quite flavorful on their own, I searched for a rosé that was light enough yet tasty and by pure happenstance, fell upon this winner at Whole Foods – 2013 Domaine d’Astros Cuvée Prestige. Beautiful in color and comprised of a blend of grenache, caladoc and cinsault grapes, this rosé has elegant notes of raspberry and fruit with mineral nuances. 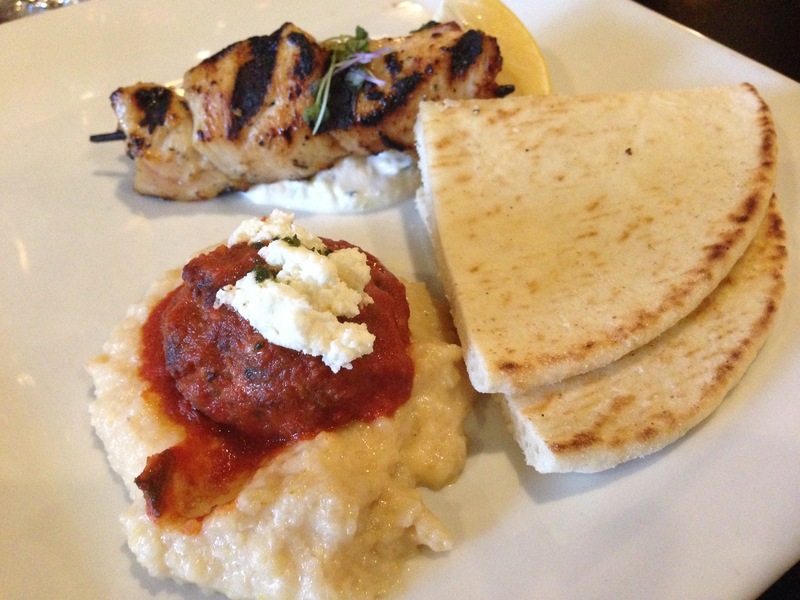 Hope you enjoy this delightful meal when you make it!